These large Country Oak Hallway Shoe Storage Benches are a great addition to any hallway. 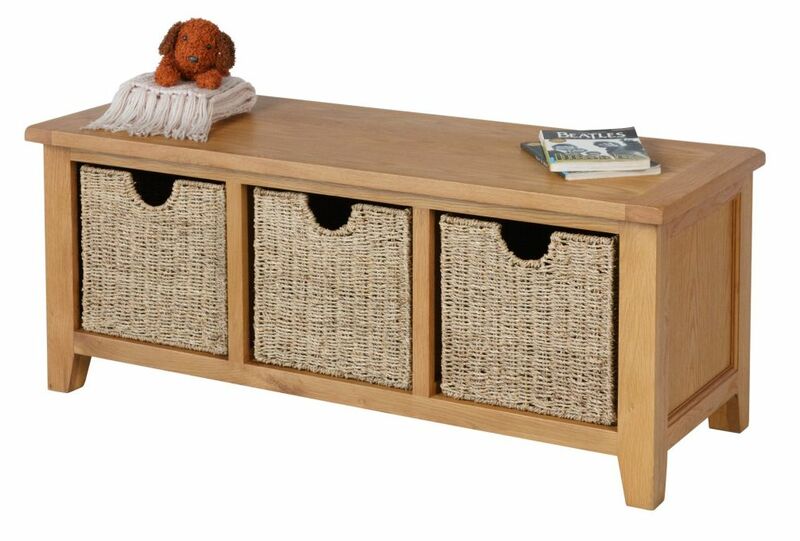 The three wicker baskets create lots of hidden space for storing muddy boots and shoes. 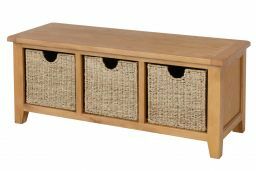 Three seater traditional wooden hallway bench in a lovely medium oak colour and finished with three square wicker storage baskets beneath for shoe storage etc. FREE delivery with no minimum spend! 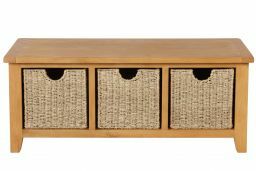 Yet again no disappointment from furniture 123, fantastic storage bench, lovely big seagrass boxes, amazing what you get in them! Quality item & great service. Thankyou!! Excellent quality, just as stated on the website, arrived on time, free delivery and friendly staff! I received my oak shoe bench yesterday which fits beautifully under my staircase. The quality of this piece of furniture is exceptional for the cost. Staff were very good in keeping in touch re delivery. I will most certainly purchase from them again in the future. One happy customer! Exactly what I was looking for at a great price. Only arrived today but looks very sturdy. The baskets are a great size to keep shoes, hats, scarves and gloves in for the winter. Delivery as agreed. Even though it was early, the delivery driver very pleasant and helpful. Very good bench . sturdy and baskets quite robust with wired frames. Wider and deeper than several others i had been looking at. each basket capable of holding 3 pairs of size 10 boots and shoes. Would recommend. Great storage and very pleased with delivery service. They rang to confirm date and then called 15 mins before delivery to make sure access would be given. Great shoe storage, fits loads of shoes in the generous baskets, well made and matches my other oak furniture a treat. Lovely addition to my hall. Lovely sturdy oak hallway storage bench. Exactly what we wanted. Delivery was perfect too. Would certainly purchase from you again.